Structural Inspection of Tesoro Golden Eagle Refinery: Avon and Amorco Wharves | Sea Engineering, Inc.
Ben C. Gerwick, Inc. and Sea Engineering conducted an above and below water structural assessment of the Golden Eagle Refinery marine terminal wharves in accordance with the recently adopted California State Lands Commission Marine Oil Terminals Engineering and Maintenance Standards(MOTEMS) requirements. 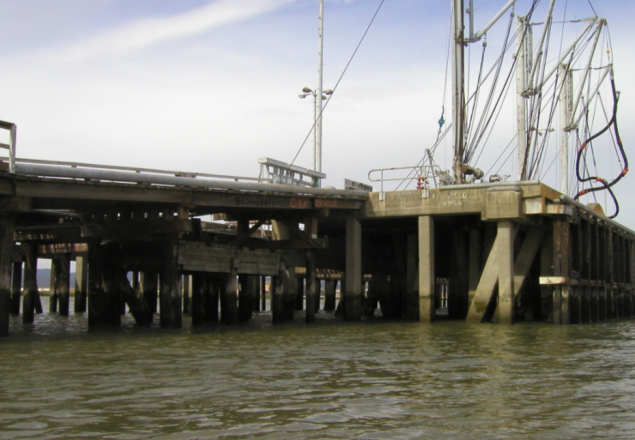 MOTEMS requires inspection, assessment, and repairs for marine terminals in an effort to avoid structural collapse and potential oil spills. Tesoro chose BCG and SEI due to our approach to scheduling the most cost effective inspection and repair sequences based on Tesoro’s proposed use and operations. The work included material testing, condition assessment ratings, vertical and seismic analyses, design of repairs, and construction cost estimates. The below water inspection included Level I through Level III surveys in accordance with the MOTEMS requirements, which are similar to the ASCE Underwater Investigations – Standard Practice Manual. Previous inspection reports were reviewed to determine actual capacities. A Condition Assessment Rating (CAR) was developed for each structural element (pile, cap beam, deck, fender, and mooring hardware). The prioritization of needed repairs and the construction cost estimates provided Tesoro with the information to shcedule and implement eight million dollars of repairs.